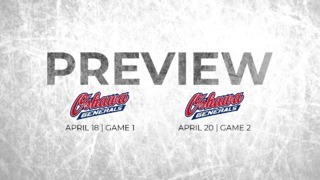 Despite a strong effort by Ottawa, which saw them outshoot the Kitchener Rangers and earn four powerplay opportunities, the 67’s were defeated 5-3 in Kitchener, Sunday afternoon, wrapping up a seven-game road trip. In the past two weekends, the Barber Poles travelled over 3,000 km and spent nearly 32 hours in the team bus. The Rangers opened the scoring at the 3:50 mark of the first period, when Cole Carter scored his 11th of the season. With a 1-0 score and less than two minutes left on the clock in the first frame, the local team doubled its lead, heading to the locker room with a two-goal lead. Ottawa cut that lead in half early in the second period, when Zack Dorval scored his first in 67’s colours – his fourth of the campaign. After Dorval’s goal, the Rangers tallied two consecutive goals – one on a penalty shot – before seeing the 67’s cut the lead in half once again with Kody Clark’s fourth of the season. After 40 minutes, the Barber Poles were down 4-2, despite outshooting the Rangers 13-7 in the middle frame. 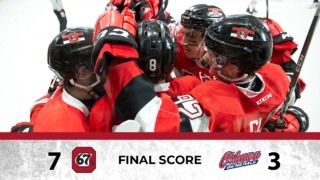 The 67’s came out strong in the opening minutes of the third period, but were unable to tie the game. After the Rangers scored their fifth goal of the day, 67’s’ captain Travis Barron netted his seventh of the season to bring Ottawa back to 5-3, but it was too little too late. Leo Lazarev, who was between the pipes for Ottawa, stopped 25 of the 30 shots he faced. 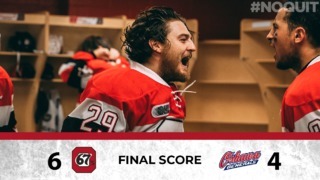 After two exhausting weekends on the road, the 67’s will now kick off a seven-game homestand against Mississauga on January 24 at 7 p.m. at the Arena at TD Place.